It took several years for Karan Singh to open Punjab Grill on 11th Street NW, just blocks from the White House. And that's because nearly everything in the 5,000-square-foot restaurant — from the marble floors, to the sandstone walls, to the 3-ton faceted ceiling — was built in India and shipped to the U.S. Here's a peek inside the newest addition to D.C.'s fine-dining scene. See photos. Wooden screens that separate the restaurant’s entryway from one of its dining rooms were carved using centuries-old techniques; the mother-of-pearl inlay on the bar was modeled after architecture in the Taj Mahal. 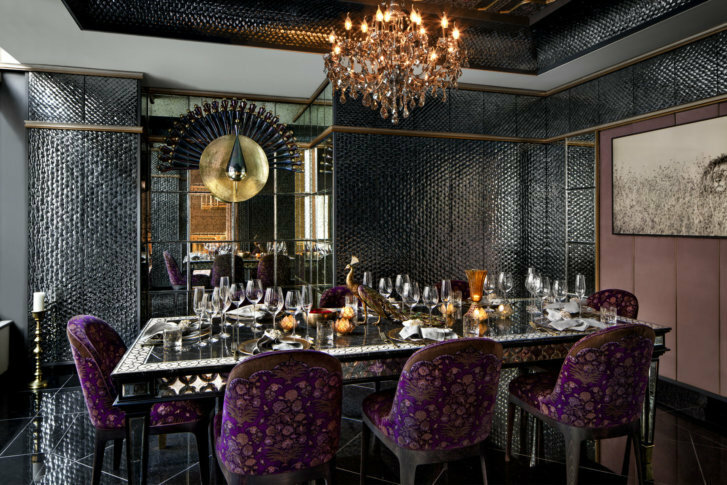 Singh even worked with an India-based textile designer to custom make fabrics for the chairs and curtains, and he created a private dining room, dubbed the “sheesh mahal,” or palace of mirrors, which is decorated with 150,000 convex mirrors. Hermès plates set the 10-seat table. “The idea was that we really wanted to change the perception of Indian food and what Indian fine-dining can be,” said Singh, a native of the Punjab region of northern India. “It is rich in dairy, rich in culture. People live to eat,” Bindra said. Tandoor-grilled meats, breads and plenty of vegetable-based stews, plus pickled vegetables and yogurt accompaniments, are common in Punjabi cuisine. The restaurant’s signature dishes include a sikandari leg of lamb, served with a gold leaf; hummus made from a puree of a classic chickpea curry; and tandoori tiger prawns. Bindra also makes a jackfruit biryani, served with basmati rice and a coconut beetroot raita. “Our main vision of our food is keeping it very authentic and very traditional, but with our interpretation,” Bindra said. Even the cocktails channel flavors commonly found in Punjab. Many contain spices, such as turmeric, garam masala, cardamom, cumin and ginger. “We wanted to have a completely immersive experience,” Singh said.